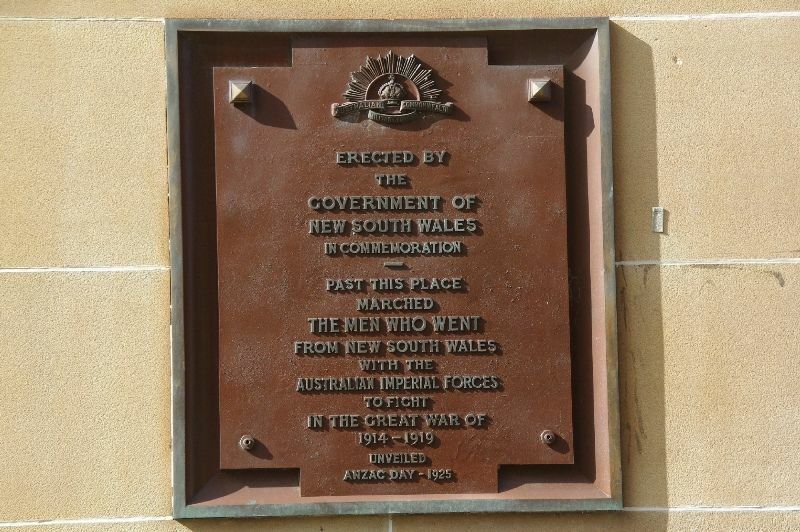 The plaque erected by the New South Wales Government in 1925 commemorates the men from New South Wales who marched past the site to fight in World War One. There was a large and impressive gathering at the unveiling of the memorial tablet on the railway arch at Eddy-avenue by Vice -Admiral Sir Dudley de Chair. It was bright with the glitter of the many war medals, some proudly worn by elderly ladies. 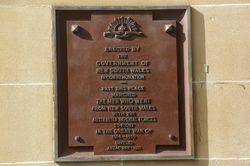 The Attorney-General, Mr. Bavin, in inviting His Excellency the Governor to unveil the memorial, remarked on the eminent suitability of the spot for a lasting memorial, to those who fought for their country. He said: "Thousands of people pass where we are today in the routine of their daily life, to their different duties. So did our fighting men, but they forgot their ordinary duties in a greater one, and passed this spot on their way to the front. The memories brought back by this tablet do not end there. 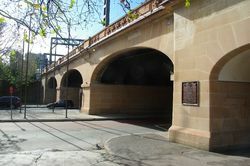 It reminds us of great deeds of our men, of their ultimate success, and the part they played in the birth of Australia as a nation. This tablet should be for ever a lesson to us." Sunday Times (Sydney), 26 April 1925.